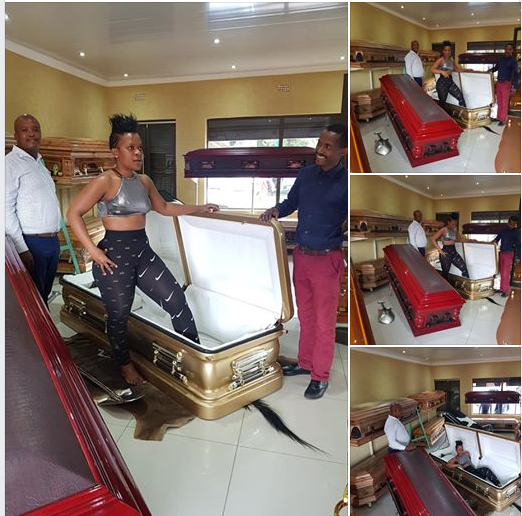 Ahead of her death, a south African lady known as Zodwa Libram Libram launch a new brand coffin for her self. Read also: Man commits suicide after pouring acid on his wife for building a house without his knowledge. She made this known on her Facebook account as she posts photos of herself testing the size of the coffin to know the one that will suit her. According to Zodwa, we all gonna die one day and i made a choice to purchase my coffin while alive. She also added that the coffin worth 150k.